Vietnamese top swimmer Nguyen Thi Anh Vien on August 21 won a gold medal in the women’s 100m backstroke category for the first time at the ongoing 29th Southeast Asia Games (SEA Games 29) in Malaysia. 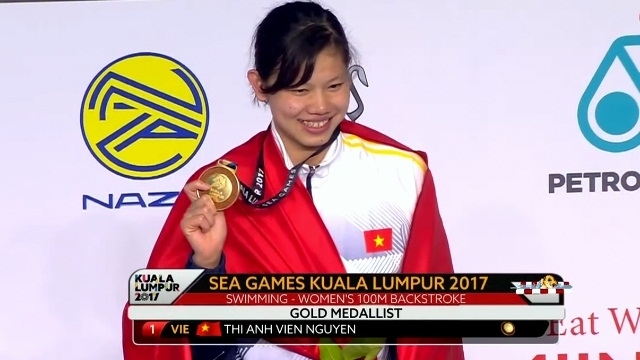 Swimmer Nguyen Thi Anh Vien earns a gold medal in women’s 100m backstroke category for the first time and also sets a new record at this event. (Screenshot capture). This is the first time “Little mermaid” Vien has grasped a gold in this event. Minutes earlier, she failed to get a positive result in the women’s 200m butterfly category, which is her strength. The 100 m backstroke is not the strength of Vietnamese swimmer in SEA Games. Legendary Singapore’s Tao Li dominated the category for long in the last six SEA Games. Tao Li defeated Vien in both SEA Games 2011 and 2013. In SEA Games 2015, Vien even did not compete in the event as Tao Li was still there. The opportunity only came for Vien in Malaysia this year when Tao Li did not attend this category. The Vietnamese came in first with a time of 1:01.89, leaving second place Nurul Fajar Fitriyati from Indonesia far behind with 1:04.10. Anh Vien's result also surpassed the SEA Games record set by Tao Li with 1:02.11. This is her first gold medal at the 29th SEA Games. Previously, the 1996 born was unexpectedly defeated in the women’s 200m butterfly finale. She competed unsuccessfully and finished in fourth place with a time of 2:16.61, less than her result qualifying round. Vien was the reigning champion in this content. Two years ago in Malaysia, she set a new record with a time of 2:11.12. Vien’s gold is also the only for Vietnam’s swimming team on the first day competition day at SEA Games 29. Vien has set a target to win ten gold medals at SEA Games 2017, surpassing the eight gold medals achieved in 2015. Previously, competing with Vien in the same women’s 200m butterfly category, her teammate Le Thi My Thao secured a silver medal with a time of 2:12.61. Meanwhile, Paul Le Nguyen and Nguyen Huu Kim Son finished third in the men’s 50m backstroke and 400m freestyle events, respectively, in their SEA Games’ debut. Overseas Vietnamese player Paul Le Nguyen also won another bronze in the men’s 50m butterfly. Vietnamese swimmers also concluded another successful day for Vietnam sports delegation at SEA Games 29. On the second official day of competition, the team net additional four golds, two silvers and four bronzes, temporarily rank third in the medal tally.